Is it a bike rally? No, just an audax. There’s something a little unsatisfying about an audax that starts with the coordinator emerging from the cafe serving as the start and finish controle, taking a long drag on a cigarette, blowing out a cloud of tobacco smoke, and saying, “Well: Off with you, then!” But that’s how the Central London Cycle Touring Club Suburban Breakout ride started in the north London neighborhood of East Finchley, under drizzly skies and temperatures more typical of early April than late June. Rolling toward Hertfordshire up Great North Road through the high streets of North Finchley, Whetstone, and Chipping Barnet, it bursts into the countryside between London proper and Potter’s Bar, finally diverting from busy A roads north of Potter’s Bar. (No mid-ride pictures, given the rainy conditions). Onto the quieter roads, I caught the tail of a group of four others, including one American woman Naomi and her English partner, Keith. With another English bloke, Roger, pulling us along at 20 mph, I was happy to sit at the back and enjoy the ride through the forested dips around Newgate Street, the windy downhill through farm fields at Bayford, the crossing of the Lee Valley at Hertingfordbury and then over the hills in Hertford, the county’s seat. After a bit of rolling, the terrain finally settled down into the narrow, hedged lanes and farm fields north and west of Hertford. We found ourselves leapfrogging with a pair of fellow audaxers, one on a mountain bike and one on a road rig, always moving substantially quicker than us but always, it seemed, behind us. Naomi informed me that one of the pair was a top mountain bike orienteer. “How can he do that and always be lost?” I asked. “He makes up for his navigational errors with radioactive speed,” she said. Well, this is Britain, and they do things their own way, I suppose. On through the scenic villages of Sacombe, Dane End, Haultwick, Wood End, and Ardeley, on ever-narrower farm tracks with hedges creating blind corners every few hundred meters, it seemed, we worked our way toward the halfway controle at Cottered. Along the way, we picked up a ponytailed, German-accented rider named Oliver, helmetless, wearing a NY Yankees cap and riding a blue Lemond, who we spotted checking out a map. He tagged along with us for awhile, then bolted ahead periodically, only to stop and check a map again, where he’d resume riding with us. Perhaps he didn’t understand the purpose of the cue sheet. Riding into Cottered, we could hear a voice on a loudspeaker, and as we pulled into the center of the town, quite a few people milling on the streets. What was this? Spectators for a randonnee? And not even a very long one? But no: It was the village’s summer fete, and we happened to be its spectators. While I found a secluded bush, fellow members of my grupetto hit the food stands for bread pudding and burgers. I was content with gel and liquid food. We pushed on, past a historic, Dutch-influenced windmill, through more rolling terrain, a few uphill false flats and wider roads, through Walkern, Watton, Datchworth, Bramfield and Cole Green. Roger and his partner dropped off the pace, so soon it was Keith, Naomi, Oliver and me. Passed once again by the lost orienteers, Oliver tried to hold their wheel, but we soon found him at another roadsign, looking at the map. As we approached Letty Green, we could see clouds darkening ahead. “I think we’re going to get wet,” Keith said. “I think I’m already wet,” I said. At Letty Green, we could hear the downpour approaching a few seconds before it hit. I grabbed my gilet out of a back pocket and put it on, but then Oliver pointed us toward a tree that gave us some shelter. We waited out the rain for a few minutes. A pair rode past us, possibly a father and teenage son, who shouted, “Where’s your sense of adventure?” Mine was all wet, and wanted to be dry. In a few minutes, the rain eased and we were back on the road. We crossed the Lee River once again, and did the big climb back out of the valley into Essendon, where the final info control was (symbols on the pub at the top of the climb: Well, there were two, but the answer our coordinator was looking for was “Rose & Crown,” not “the Candlestick”). Oliver was feeling energetic and so was I, so we charged through Essendon and back to the Great North Road, where we turned south and headed back toward Potter’s Bar. Somewhere along the way, we passed the father and son duo, and although they caught up to us at the one stoplight in Potter’s Bar, we were smelling the barn. 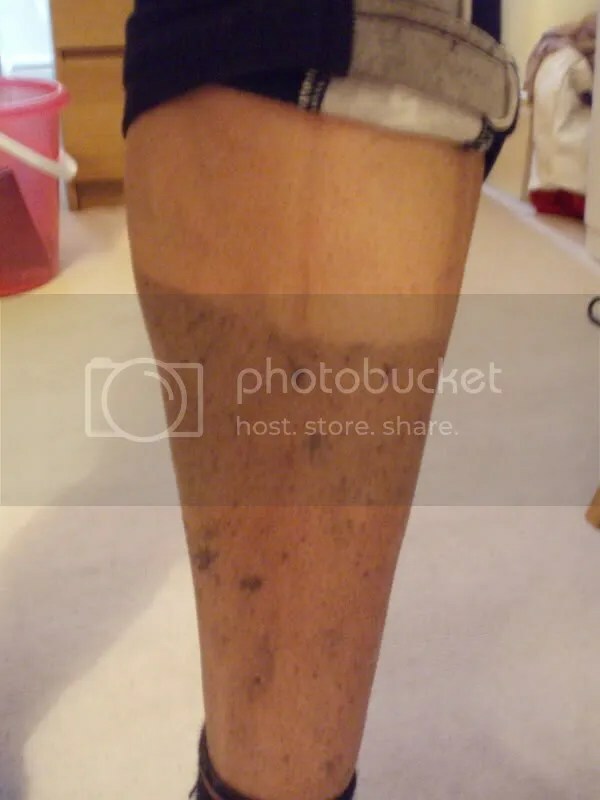 How you get a tan from riding in the English rain. Along the way, the liquid food had left a small cramp in my stomach, and I began dreaming of a plate of beans and toast back at the cafe. Our intensity rose as we chased through the countryside, finally coming to a halt at the first stoplight in Chipping Barnet. “Well, that was anticlimactic,” Oliver said. At the next light, I attempted to paddle through the gutter past a stop car, but clipped my hand on a wing mirror, sending me clattering to the pavement. I sprang up quickly with apologies to the driver, but knew there would be a bruise (there is, left leg, right above the knee). Back through the suburbs we rode, finally arriving back in East Finchley somewhere around 2:15. 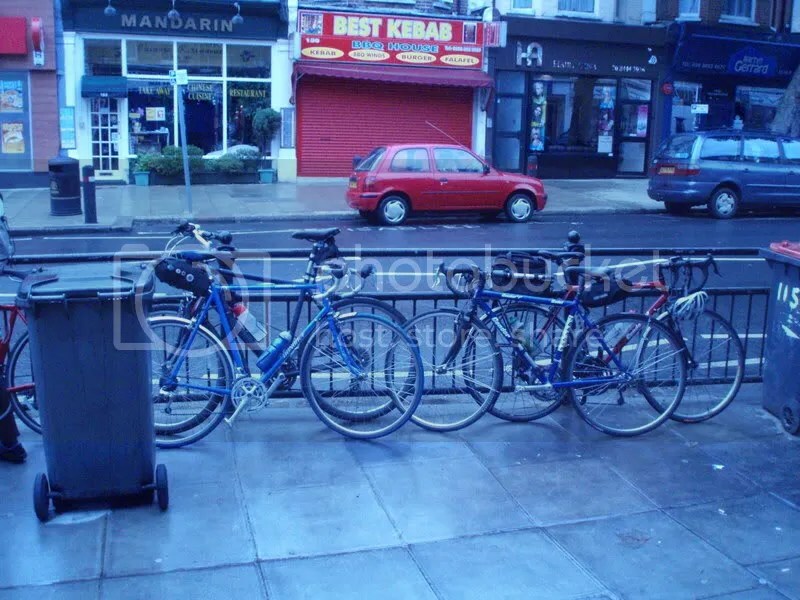 The rain had eased enough for tables to be set up outdoors for muddy cyclists. Nobody was smoking and the lost orienteers were long gone. I ordered a coffee and that dreamed-of beans on toast.